Before started talking about Beacons, first lets understand what iBeacon is? So the term iBeacon and Beacon are often used interchangeably. iBeacon is Apple’s implementation of Bluetooth low-energy (BLE) wireless technology to create a different way of providing location-based information and services to iPhones and other iOS devices. CeBIT Australia being one of the largest IT event is going to focus on iBeacon as well in addition to mobility solutions, FinTech solutions, internet of things and many more. CDN Software Solutions, an innovative IT solutions and service provider company, always looking for new possibilities in technologies, has well adopted thos technology and will be showcasing the work in CeBIT Australia. Beacons allow mobile apps to listen for signals from beacons in the physical world and react accordingly. iBeacon technology allow Mobile Apps to understand their position on a micro-local scale, and deliver hyper-contextual content to users based on location. CDN is exhibiting in CeBIT Australia for the 5th consecutive time. This year we are at stand no. 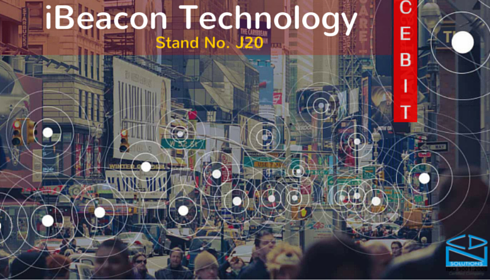 J20, with all the latest innovations in technologies like iBeacon, Internet of Things, Hardware Integration, Augmented Reality, Django, Odoo, Swift, Python, Laravel, etc. So let’s talk about iBeacon right now. Why is iBeacon Technology Trending? With an iBeacon network, mobile apps with beacon will be able to understand exactly where a customer is. This provides an opportunity to send customers highly contextual, hyper-local, meaningful messages and advertisements on their smartphones. So this on-the-spot activity build trust for your organization and also helps to explore your business. iBeacon provides a digital extension into the physical world. Retail or other venues that have beacons in place can detect where a customer is at any given moment. Then the retailer or other business can push timely messages to that customer promoting products or providing other useful information. It includes so many things like special offers , targeted advertisements, and helpful reminders [“You have a meeting today at 4pm with Mark!”]. iBeacon Technology is one of the trending things now a days and it will definitely be the talk of the town in the upcoming years. Want to know more about iBeacon and other latest technologies to speed-up your business? Then do meet CDN Software Solutions in CeBIT Australia 2016 at stand J20. You can also get free ticket for CeBIT Australia 2016 from us to experience this world’s best IT show. Contact us here to avail the same.